Ah, sweet, sweet summer solstice. The time of year here in Minnesota when the thumb-long zucchini in your garden grow into something the size of baseball bats overnight. The time of year when the pretty college student working at the movie theatre lets her friends in for free when no one’s looking. Your son loses yet another Little League game, mosquitoes descend upon you like a biblical plague, and neighbors up and down the block exchange batches of homemade wine, the kind of wine that takes the enamel off teeth. After a swig of it, you’re afraid to exhale for fear of starting somebody’s garage on fire. For Pat Dennis, mystery writer and stand-up comedienne extraordinaire, summer is great, but in Minnesota, hotdish is a year-round phenomenon. 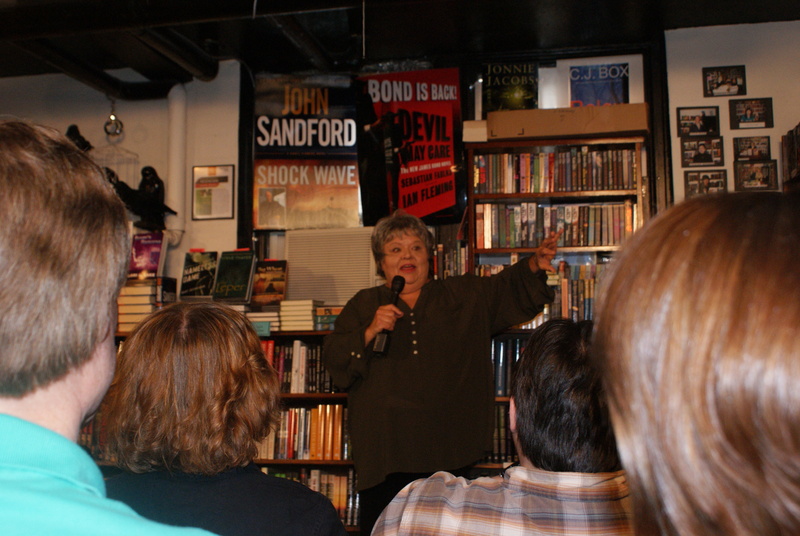 Tuesday night she performed at Once Upon A Crime bookstore for KSMQ, southern Minnesota’s PBS channel, in town filming a documentary tentatively called, Minnesota Hotdish: A Love Story. Pat hails from Chicago but has lived in Minnesota for 28 years. “Which makes me a newcomer,” she says and we laugh. Pat hadn’t heard of the term hotdish until she arrived in Minnesota. By her estimation, the heartland word for casserole contains a can of soup, a can of veggies, I-got-it-on-sale meat, and rice. It’s then baked until all the moisture’s been sucked out of it. “Hotdish is the sensible shoes of fine cuisine,” she states. This from a woman who uses a leaf blower to clean her house. She has also been a hotdish judge where she once had to taste 80 different hotdishes. Besides deciding which one tasted best, she wanted to give out awards for, among other things, most dry, most burnt, and most calories, but thought better of it. After her very funny performance, KSMQ wanted to get more laughter from another camera angle, so there was this magical moment where we’re all laughing on purpose while they’re filming us and it got so ridiculous we sincerely could hardly stop. The hotdish documentary is scheduled to come out on PBS sometime this fall. In Pat’s collection of mystery short stories, Hotdish to Die For, the weapon of choice is of course hotdish. The book has sold well everywhere except in Grand Rapids where it has been banned for containing cuss words. Knowing that, whether it’s winter, spring, summer or fall, how can anyone NOT want to live here?